Fairfax county has officially begun work today on the second of two projects that developers hope will constitute a monumental remake of the beltway suburb. Together, the real estate megaprojects will add two metro stations, millions of square feet of office, reshape the streets, and build untold condominiums and apartments on over 50 acres of land in central Tysons. 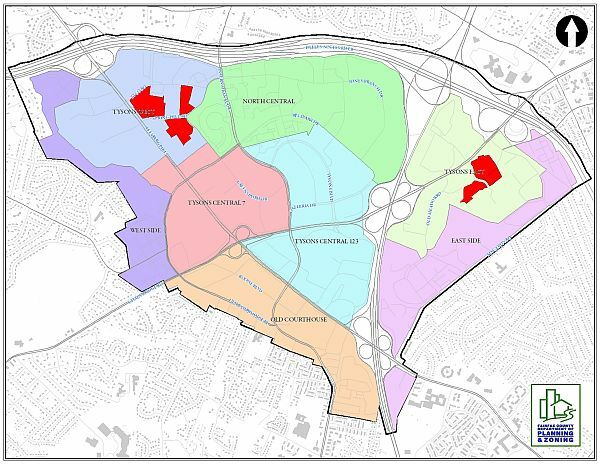 County planners today "officially accepted" the Capital One application for study, and will now begin the long process evaluating the 23 acre development as they recently did for the Georgelas Group's "Tysonsdemo" project that will transform 28 acres over 3 sites in central Tysons. 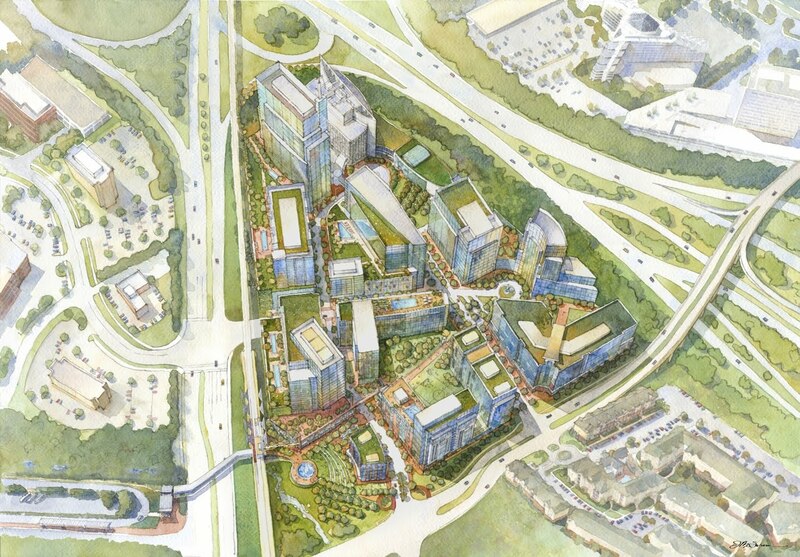 The two projects have more potential to change the face of Tysons than the sum of all other proposed projects combined, and County officials acknowledge that today they can move the process from the minutia of filing requirements to public consideration of its merits. The Georgelas project was the first - possibly of many - accepted for consideration by the county under the auspices of the newly minted Comprehensive Plan, a restructured set of guidelines designed to move Tysons from its suburban inception to an urban grid. 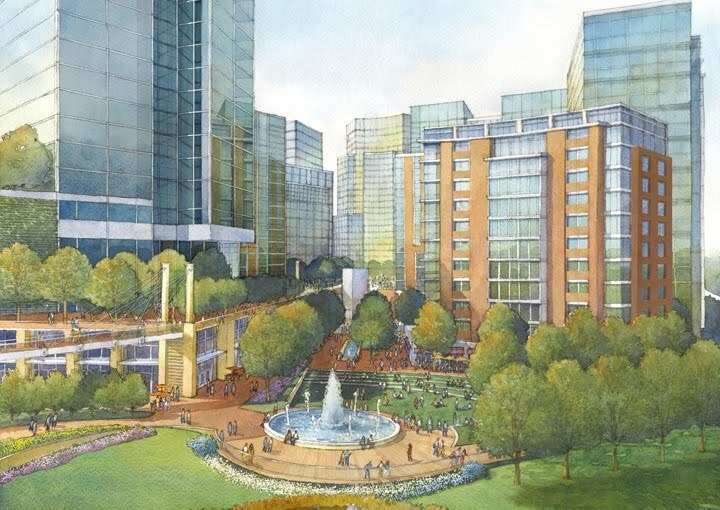 Tysons Planners have been meeting regularly with Capital One and Georgelas executives to hammer out a workable proposal, and today's technical acceptance of the Capital One plan moves the project to a full staff review with public comment periods. The staff will ultimately forward their recommendations for the two projects to the Board of Supervisors for judgment. 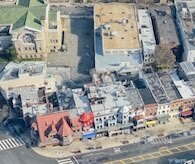 The turning point, albeit a technical one, was welcomed not just by the sponsoring developers but by a county that has struggled for years to craft a metamorphic plan in what has been an urban planner's nightmare - wide, high-speed streets that isolate buildings and kill meaningful retail. 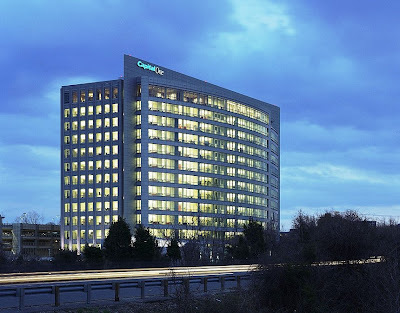 "Its a big deal in the sense that Capital One [and Georgelas] are the first projects that will begin to transform Tysons" said Brian Worthy, Public Information Officer for Fairfax. "Its very exciting that these proposals are taking advantage of the new plan," said Worthy. 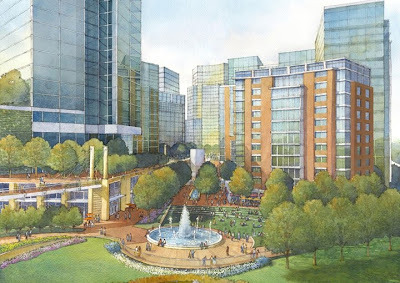 "Capital One’s application helps to advance the transformation of Tysons Corner into a walkable, livable urban center because it proposes high-density, mixed-used development near the Metro. This is exactly the kind of transit-oriented development that the plan to transform Tysons calls for." Capital One officials were unresponsive, but other participants in the process made it clear they thought the proposal had strong transformative potential. The site plan calls for 5 millions square feet in total development - 2.1 million s.f. 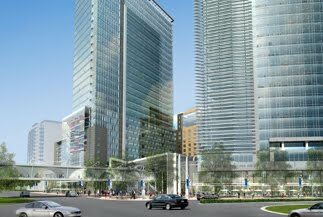 of office space rising as high as 392 feet, a thousand or so residential units rising 20 stories, as well as hotels, parks, plazas and retail, all connected to what will be a brand new Tysons East Metro station. The design team includes Bonstra Haresign as Urban Planner and Architect and William H. Gordon Associates as Civil Engineer and Landscape Architect. The Georgelas Group plans to redevelop 28 acres on three sites throughout central Tysons, with 14 buildings totaling more than 6 million square feet designed by WDG Architecture and Parker Rodriquez landscape architects. The plan includes office buildings that rise up to 360 feet, a Metro station and surrounding plaza, central "civic park", apartment buildings, and retail incorporated into parking garages at street level to mask their street presence topped with "sky parks." Development will be balanced with civic areas and hotels that planners gauge will result in an overall presence of 65% office space and 20% residential usage. All office buildings will be designed for a LEED Silver ranking and for residences to earn general LEED certification, all designed to achieve "the urban aesthetic vision for Tysons." 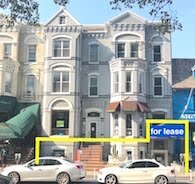 Still, the proposal's impact is theoretical, as the plan must meander through the approval process, and Capital One has little inclination to start building right away, or even committing to a time frame for its first building. While it tentatively calls its 15-story office building adjacent to the current headquarters "the most likely to be constructed in the near term," it only promises to keep the plan as "an option ...should the need arise." Similarly, attorneys for the Georgelas Group note that a full build-out "will take years perhaps decades" to complete even under the most optimistic scenario. Work will begin first around the new Tysons West Metro station with its tallest office building and possibly a condominium and retail element at the same time, but no timeframe is even hinted at in the planning documents. Cityline Partners and Mitre will likely precede the two with plans for a 340,000 s.f. office building likely to move more quickly through approval and into construction. "We're at the start of a 40 year process," says Worthy, cautioning against expectations of a sudden transformation for Tysons. In fact some involved in the process see significant technical and practical hurdles in a vision that ties in Metro stations and extends streets while attempting a more cosmopolitan texture. "These guys will be guinea pigs for a brand new process," says one source familiar with negotiations, "all of this is too new to make any bets on how quickly it will proceed." That doesn't look "urban" at all... it looks like classic "towers in a park" style planning. They need to make it more Reston Town Center or even Rockville Town Center, and less... Houston. It does not look walkable or connected at all. It looks car-centric. 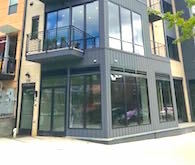 All buildings need to face the street ON the sidewalk, not 20 feet back from the sidewalk with a sprawl-like and unusable grass lawn in front. They need to take a look at how White Flint is being redeveloped for real results. All of the Tysons developers seem to be building individual tiny self-contained "cities" with giant streets on their borders, effectively cutting off any meaningful pedestrian access to the rest of the area. Nobody, not even the County, seems to know what they're doing. In the end, they will be lauded for their vague vision, but derided for the results. I see nothing even close to resembling the area's Ballstons, Bethesdas, and Silver Springs in any of these plans, other than the tall buildings. I forgot to add that the most appalling aspect in all of this is that nobody seems willing to SAY anything that might rock the boat even slightly. It's as if Fairfax County officials are unwilling to force the hand of developers who don't know what they're doing for fear of retaliation. But retaliation is doubtfully in the cards; these guys stand to make many millions off of the developments. I think they'll listen to your arguments. This "towers in the park" style is what happens when you let owners of enormous properties plan developments in one fell swoop. They all end up looking so inorganic and anti-urban that the negative aspects begin to outweigh the benefits. If they need to be forced to develop in much smaller parcels, one at a time, then so be it. This process is obviously not working towards the intended goal of a true urban center like Silver Spring or Bethesda or Arlington. It's got berms, it's got buffers, it's got overpasses, it's got inconvenient plazas. If this is a walkable urban grid, I will eat my hat. Actually, it is "tall sprawl." Compare with the existing sprawl development on the other side of the highways. The parking lots are underground and the buildings are taller... otherwise, it's a similar layout. And is that a daylighted creek located right next to the Metro station? That's the prime location, precisely where the most intensive and active urban streets should be. What a waste of incredibly expensive infrastructure. What a missed opportunity. 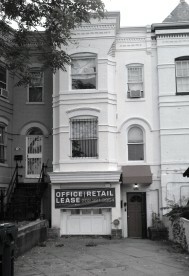 This demonstrates that density alone is not sufficient to create a true sense of place. Granted, the site is a challenge -- cut off by wide roads on all sides -- but this could have been turned into a real enclave. Unfortunately, it looks like it was designed in plan and then projected up, instead of being conceived experientially from the pedestrian's standpoint. The first rendering is basically Modernist urban planning, except with acres of concrete replaced by acres of green space. The fountain-park rendering reminds me of a 1960's rendering of L'Enfant Plaza, with the Banneker Fountain surrounded by gamboling people, attracted there by...one supposes by the fountain, there being no streetscape retail or entertainment options visible. The green version is upgrade, to be sure, but no more likely to produce the pedestrian-friendly "city" that keeps being discussed. Cover more of the ground! Good Lord. I will be dead in 40 years! Virginia Planning: Shoot. Ready. Aim. Shanghai East (or West?)! Urban design as architectural zoo-keeping - what shape of tower are we missing? Too bad we can't identify any space types only gaps. nesting office buildings on top of a giant parking garage. who's driving the bus? can't we all just agree to do better? what's the point otherwise. Wow. Agree with everyone else that the plans look terribly anti-urban. "Tall sprawl" is exactly right. 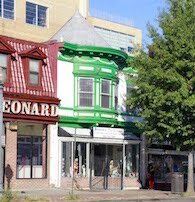 You'd think the developers have never stepped a foot in Silver Spring, Bethesda, etc. Transforming the RB corridor didn’t happen suddenly. 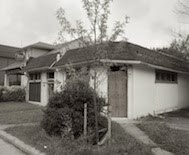 I recall a dilapidated Wilson Blvd through most of the 80’s. 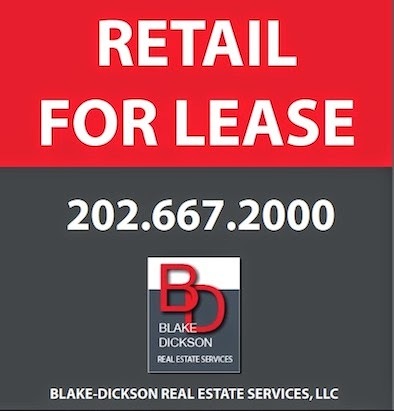 But gradually the area has blossomed as has Reston Town center. 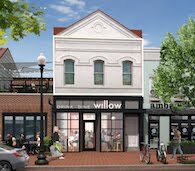 Most architectural and design firms today get “urbanism” and developers are sensitive to the market appeal of “livable” and “walkable”. Give these initiatives a chance before rushing to judgment. Trying to gauge from a few renderings as to how 5 or 10 million square feet will ultimately turn out in the future, where multiple economic cycles will help determine what gets built and when, is folly. Fairfax County planners have done an admirable job in balancing the economic and environmental aspects of the Transit Oriented Development vision for Tysons. These two plans will begin the slow and gradual emergence of the “grid of streets” that is so central to the transformation of Tysons. While I may not be around to see it fully built out, I for one am encouraged by what I see. Akridge's Half Street Half Way There?